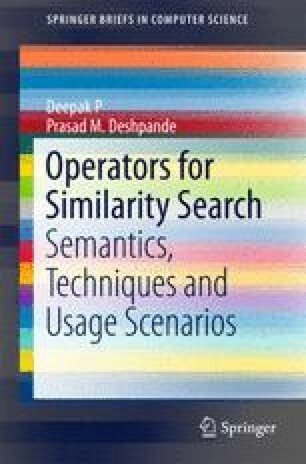 We consider categorization of similarity operators to aid easy positioning and assimilation of the semantics of different operators. The first classification puts operators in one of two classes based on whether it produces ordered or unordered result sets, whereas the second considers the usage of attributes in the operator-specific similarity representations for an object. We consider the implications of each of these choices and give examples of operators that fall into each of these four classes. We then look at features; a set of tools that are available for the designer of any search system to add to operators to tune the system to specific search needs. We outline the semantics of the result set transformation under each of these features, illustrate motivating scenarios for the usage of such features, and list operators from literature that have made use of them. Through such a discussion of categorization of operators, and features that could be used along with operators, we provide the interested reader with mental tools for quickly positioning operators with respect to the categories and the features they employ.